Workout and Bodybuilding Supplement Reviews: Six Star Pro Nutrition - Creatine x3 Review. Six Star Pro Nutrition - Creatine x3 Review. Creatine X3 by Six Star Pro Nutrition. Creatine X3 by Six Star Pro Nutrition is for athletes, active men and women, body builders and strength trainers. 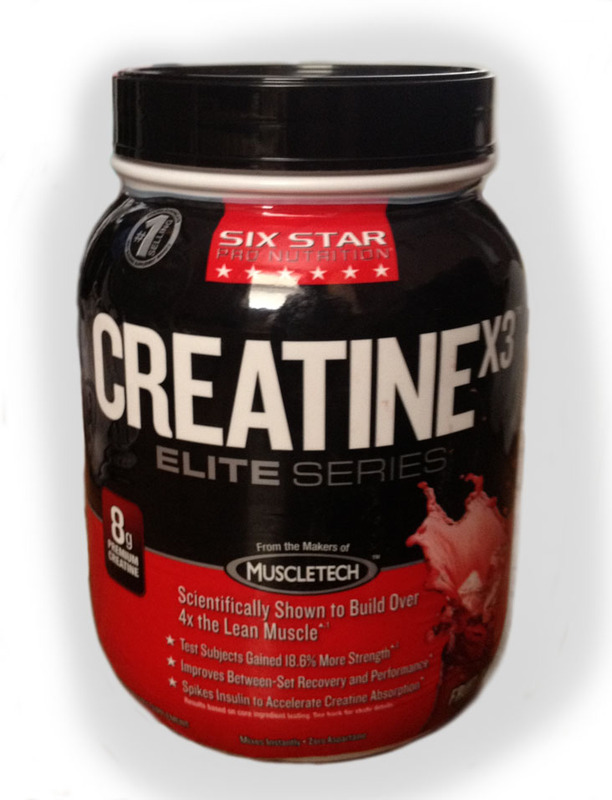 Creatine X3 helps to build muscle and with the post-workout recovery process. This brand: Six Star Pro Nutrition Creatine X3 is very tasteful. It taste like real fruit punch making it very enjoyable to drink. It also dissolves very easy on water or any juice of your choice. I noticed an improvement on muscle definition after 2 weeks of taking Creatine X3. Just make sure you maintain an adequate hydration level as the label says. As energy goes, I feel no effect. Creatine X3 is a good workout supplement to add to your supplement stack. I would recommend it to a friend. More information about creatine: Creatine Article. Creatinine X# really helps. I have been using it only for a month and it had done wonders for me. Building lean muscle mass is hard if you do not use supplements. Creatine is the most comon supplement used by almost all bodybuilders. It has great effects on muscle growth, and absolutely no side effects on your health. Its amazing, i have never tried Creatine before but my friend recommended me USP Labs test powder for me to gain bodybuilding muscles and it works well to me, even i didn't find anything bad in it. but can you tell me some reviews about Creatine, so that i could be able to compare them? Does anyone know about Cellucor D4 Thermo Shock? Are Creatine more effective than protein supplements? In today’s world supplements are essential for the growth of body. One should choose a supplement after a good research on various test powder. The USP Labs Test Powder is the one which is manufactured after a long research over human body. It contains every vital nutrient in proper quantity.